This past month I had the pleasure of being the Day-of Coordinator for two weddings. The only rough part was that they took place the same weekend. I was reminded that I’m not as young and spry as I used to be, but I had a lot of fun and learned a ton. 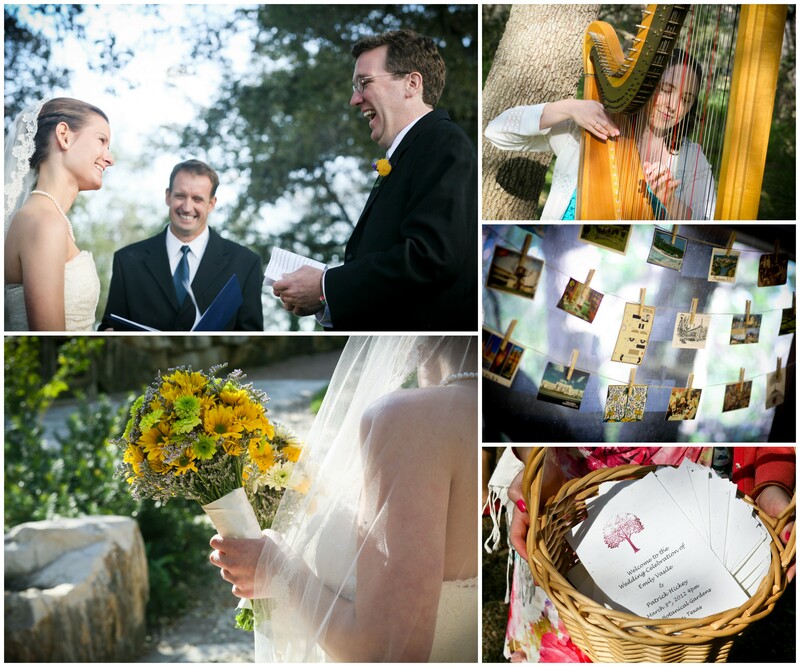 Emily and Patrick had a lovely wedding at the Zilker Botanical Gardens in early March. 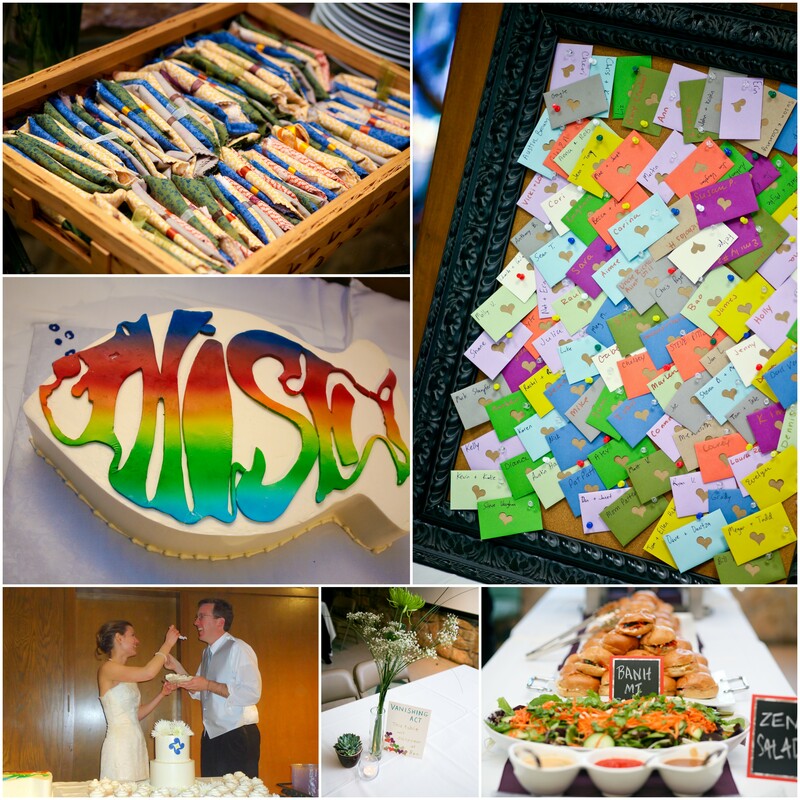 The main wedding colors were gray, dark purple, and green. Before the wedding, I worked with Emily on brainstorming ideas/planning, visited the venue to discuss layout/setup, and helped organize the ceremony rehearsal. On the morning of the big day, Emily’s friends and I used flowers from Central Market to arrange three bouquets, five boutonnieres, and 20 centerpieces. For my day-of duties, I managed the compressed setup/cleanup; coordinated the photo session; kept the schedule on track; and addressed minor snafus that popped up. Emily and Patrick are so agreeable and fun-loving that it made the full day much easier. The vegetarian dinner was catered by Me So Hungry while the yummy strawberry, carrot, and chocolate cakes were from Krissy’s Cakes. Jon Bolden photographed the ceremony and part of the reception. For drinks, there were kegs of local beer including Austin Beerworks, wine, champagne, and Texas Coffee Traders coffee. Emily hosted a craft party a few weeks before the wedding where friends cut out fabric napkins, made signs, and planted succulents. For favors, Emily and Patrick wrote little notes to each of their guests. There was a ton of food, celebratory drinking, joyful dancing, and general merriment—leading to a very fun wedding bash. Now onto a happy marriage! Yay! 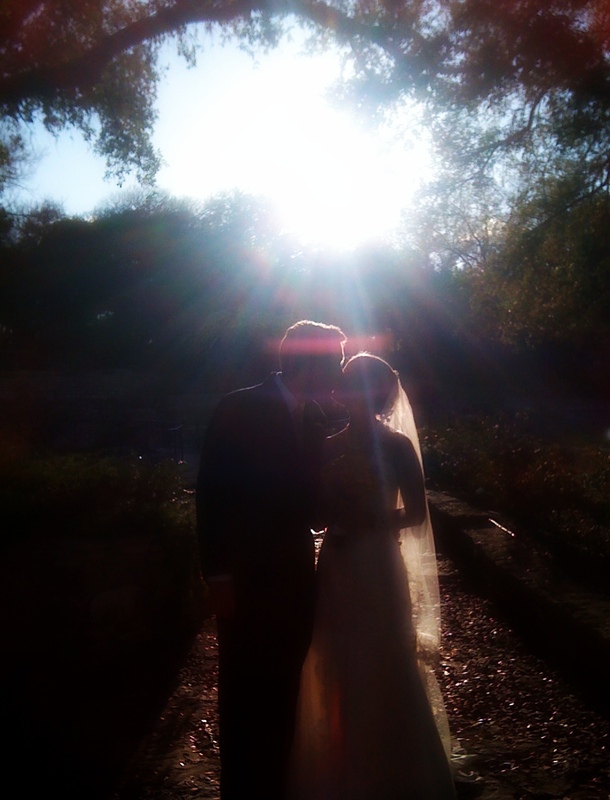 This entry was posted in Decorations, Weddings and tagged DOC, Zilker Botanical Gardens Wedding. Bookmark the permalink. Oooo Banh mi! I love me a wedding with some banh mi.